In my current project I have to create a dashboards that reflects the actual (and historical) situation in a factory. At first I tried something like the dashboards Anychart provides on it's site, like this. It is possible to create that kind of stuff in APEX, but then you have to generate all the XML data by yourself. And the fastest way to do something is...don't do it at all. Kinda cool huh? I also created an example on apex.oracle.com (refreshes every 3 seconds with random data). 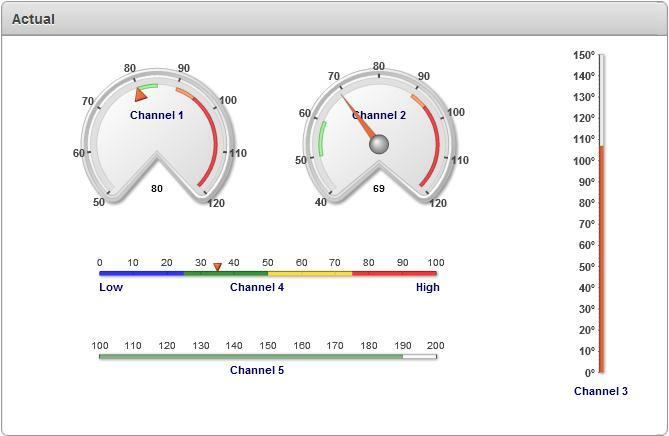 Linear gauge charts are not one of our supported and licensed chart types within Oracle Application Express. Only those chart types exposed via our Create wizards are supported. What is the "small" tweak to the XML that you need to make? Care to share? @Buzz: See the (changed) example. You can see the customized (non formatted) Chart XML using the little icons in the report on the right hand side. @Hilary: "Not licensed" = "illegal"? That's strange, because I only used the default/standard APEX Features. Also your "support clause" surprises me...so Custom Chart XML isn't supported at all??? (I guess that's not what you mean, but pls clarify). Our charts license allows Oracle APEX customers to create the chart types that we expose via our Create wizards i.e. 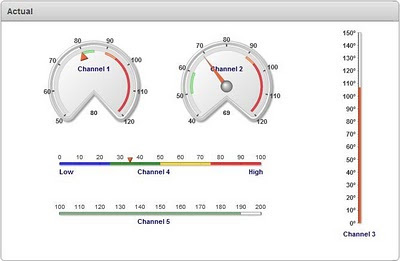 Linear gauge charts are not one of our licensed chart types, and are not exposed via our Create wizards. Therefore, unless you obtain a separate license from AnyChart, you are not licensed to use that chart type in Oracle Application Express. There tends to be some confusion around this area, but hopefully this will help to clarify things. Thank you for the update and the effort! How do you create the ability to have chart data change like this? and the charts refresh is set to every 3 seconds.